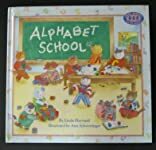 At Alphabet School the kittens perform a variety of activities from A to Z, beginning with Angora adding and Bianca building with blocks and concluding with Yolanda yawning and Zachary zigzagging through a circle of other pupils. About Alphabet School-Hayward (Author) : Alphabet School-Hayward is a published author of children's books. Published credits of Alphabet School-Hayward include ALPHABET SCHOOL (Just Right for 3's and 4's/Just Right Books).